The following is a guest post from Lisa Cohen and an entry in February’s Self-Publishing Writing Contest. If you’d have asked me a year ago about self publishing, I would have given you all sort of persuasive reasons why it wasn’t right for me. A year ago, it wouldn’t have been right, not because of any intrinsic problem with going ‘indi’, but primarily because I hadn’t educated myself about the process. Technology has driven the incredible rise of the ebook. Author tools, some free, others low cost, have made the barrier to self publishing very low, indeed. That is both a blessing and a curse. It means that the biggest obstacle to publishing isn’t price, knowledge, or equipment; it’s discoverability. When any ordinary Joe or Jane Writer can upload a file and in moments have an ebook for sale in multiple venues, what’s to stop that writer from doing so? The promise of the author-as-publisher is very alluring, especially with the royalty rates as generous as they are on the self publishing platforms. It’s hard to justify holding out for the brass ring of a book contract when the typical hardcover will earn the author far less than each ebook independently released. The perils of self publishing are also pretty clear: you have to be willing to wear a lot of hats. Most writers know that just being a writer is no longer an option, no matter what route they travel. But the indi road means needing to know or find: editing, proofreading, cover design, formatting, marketing, distribution, and promotion. Every single one of these skills is essential for a successful book release. Let me tell you–it’s a lot of work. The least of it is the actual formatting of a manuscript and its uploading. But that’s where a lot of writers stop. Having read quite a few self published books in my genre (YA/fantasy), it is clear to me that many writers have stumbled into a few common pitfalls. The most common is publishing a manuscript before it is ready to be a book. The cold, hard fact about the traditional system of gatekeepers (agents and editors at publishing houses) is that it screened out a lot of books that weren’t ready for prime time. My own, included. When I look back at some of the stories I queried in my very beginning, baby steps six years ago, the form rejections I received were, in fact, a kindness. Had self publishing been a simpler option then, would I have forged ahead and put my work out there? I’m not sure, but I am glad I didn’t. Another pitfall is lack of knowledge about the process. Authors get tripped up in one of two ways. Some go it alone and self-edit, self-design a cover, and pass a typically formatted word processor file through a conversion program. What emerges is a poorly formatted novel with a generic (or worse, unreadable) cover, and strange symbols peppered through the pages or layout issues. On the other extreme, are authors who fear the process and give up their control over the process and overpay for services they probably don’t need (eg, uploading to digital marketplaces) and lose the ability to easily make changes to their ebook output. The more you know about the world of epublishing, the more you will be able to make informed choices about which aspects you can manage and which ones you need to outsource. Here is a list of steps and resources that may help you turn pitfalls and perils into promises. The world of independent publishing is changing so rapidly, that even these resources may be outdated by the time you are ready to dip your toes in the pool, so keep yourself educated and be your best advocate. And good luck! About the Author: LJ Cohen is the writing persona of Lisa Janice Cohen, poet, novelist, blogger, local food enthusiast, Doctor Who fan, and relentless optimist. Lisa lives just outside of Boston with her family, two dogs (only one of which actually ever listens to her) and the occasional international student. Lisa is represented by Nephele Tempest of The Knight Agency. 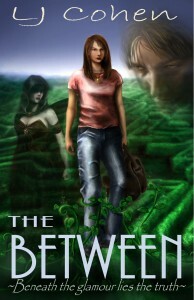 THE BETWEEN, a YA fantasy, is her publishing debut. Thank you for the feedback. I have read/used Mark Coker’s Smashwords formatting guide–but I vastly prefer having more control over the output. Having said that, I have my novel in Smashword’s catalog as well, so I’ve obviously used the ‘meatgrinder’ successfully. I ended up combining what I saw as the best practices from Coker’s guide, along with other web resources and my own experience in a (free) guide on eBook conversion/formatting for writers. Great post. Bookmarking it for future reference. Thanks, Dimitri! I loved Lisa’s post, too. Wonderful post. Thank you. I have self-published four books and you can never have enough information. Lisa did a great job, didn’t she? I’m so glad you enjoyed the post! Great post. The cover design bit is good advise. I actually know quite a bit about Photoshop and tried to make my own. Needless to say it looked like garbage and I eventually looked for professional help.